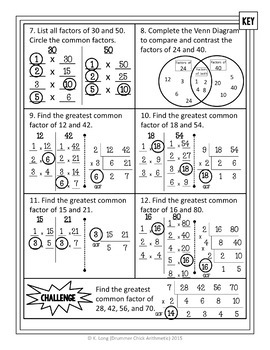 This twelve-question practice sheet covers prime and composite numbers, factors, common factors, and greatest common factor. 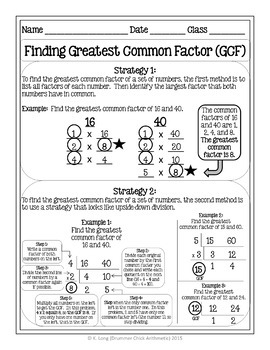 Useful as guided practice, independent practice, homework, or assessment! The problems in the left-hand column mirror those in the right-hand column, so you could use one side as guided practice and the other as independent practice. 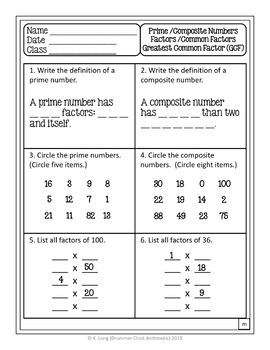 A modified version (marked with an "m" in the bottom corner) is also included which is suitable for students learning English, students requiring modifications, or any student needing a little extra help. 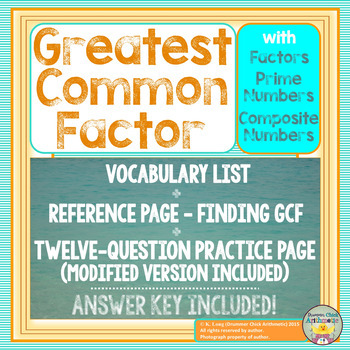 Also included is a vocabulary sheet with examples (factors, prime number, composite number) and a reference sheet explaining two methods of finding the GCF (listing all factors and using upside-down division). I'd love to have you as a follower! Simply click the star near my name ("Follow Me") to be notified by email when new upper-elementary and middle-school math products are added. If you make a purchase, thank you and remember that you can return to your "My Purchases" page at any time to leave feedback on this product. I'd love to know how it worked in your classroom, and you'll earn valuable credits which can be used towards future TpT purchases! Thank you for visiting Drummer Chick Arithmetic! You are a rock star for all that you do for your students!